Update on things happening in Rotary and indigenous communities, including current events – Rotary luncheons with guest speakers, open community and cultural gatherings, etc. McGill University has announced it will change the name of its men's varsity sports teams, the Redmen, due to widespread acknowledgement of the term's offensiveness toward Indigenous peoples. McGill Principal Suzanne Fortier announced the decision by email to students last Friday morning, saying it was based on new principles of commemoration and renaming that the university established in December 2018. In the email, Fortier also cited major English dictionaries as sources confirming the term's offensive connotations. "We cannot ignore this contemporary understanding. Intention, however benign, does not negate prejudicial effect," said Fortier. "Inclusion and respect are at the core of our university's principles and values; pejoratives run contrary to who we are as a community." At the New Richmond High School in Quebec, Principal Michael Isaac has brought Indigenous history and culture into the classroom after finding that "Quebec's Education Ministry's high school curriculum simply wasn't up to the task." CBC reports that approximately 60% of the school's population is of Mi'kmaw heritage, as is Isaac himself, who argued that ignoring an entire segment of the population is both damaging for those of Indigenous heritage and a disservice to Quebec. "Physics, chemistry, biology - you name a subject being taught in school, we have evidence that shows that our ancestors were well-versed in those subject areas," said Isaac. The school has held a ceremony to mark the arrival of spring, participated in Turtle Island Reads, held a Sisters in Spirit vigil to honour missing and murdered Indigenous women and girls, and several other initiatives. Student Jacob Lagouffe explained that the school's approach to Indigenous knowledge has allowed him to learn new things about his heritage, and that he hopes there will be more opportunities in school to discuss important issues. "It's really good to bring it up because we need to spread awareness about this subject," said Lagouffe, "and have more people know about it, to (bring) change in our society." Actua's InSTEM program will be expanded to include communities in the Yukon Northwest Territories, and northern Alberta. The InSTEM program is a high school for-credit program that blends land-based learning, traditional knowledge, science and technology. Doug Dokis, director of Actua's InSTEM program and Anishinaabe from Dokis First Nation near North Bay, explained that the program has a greater impact on the student's educational outcomes because of its for-credit nature. "It's letting these youth in these regions know the local knowledge they inherently have is equally as valuable as a STEM knowledge that they're receiving within the school systems," said Dokis. The program was piloted in 2017 in Ottawa, and expanded to Six Nations, Dokis First Nation, and Akwesasne last summer. The program includes an Indigenous science course that students take part in during the academic year and a land-based program in the summer that takes place in students' communities. The program received $2.3M from the Government of Canada to support the expansion. The Rotary Club of Toronto is presenting guest speaker John Millar from Water First on Friday, April 26th @12 noon. Tickets $55.00 Location to be determined. This is a great hopeful program, supported by the Rotary Club of Toronto’s Indigenous Service Committee, training indigenous people to be water technicians allowing them to work in their communities , monitoring water quality and maintaining treatment systems. Practical, hopeful education and training! 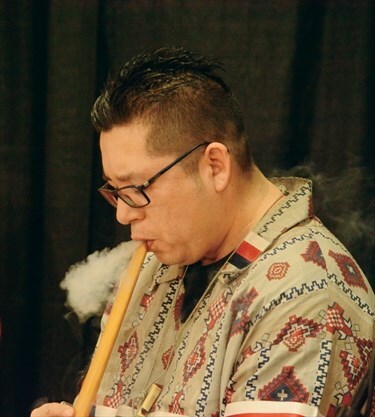 Confederation College recently celebrated the opening of a Smudging Room on its Thunder Bay campus. The room will be used for traditional ceremonies and will provide a quiet place for students and Elders to meet. "Our students come from all over the Northwest," said Confederation President Kathleen Lynch. "We want to make sure that we acknowledge the history of what's happened with Indigenous people, and also, though, offer support and acknowledgement that we want to be partners with them on the journey forward." Brenda Small, Vice-President of the Centre for Policy and Research in Indigenous Learning at the college, explained that the space "is a promise from Confederation College to recognize and respect Indigenous students, employees, elders, and partners in practicing this custom." A new $26M science building will draw together Western science and Indigenous traditional knowledge and be a "cornerstone" of the soon-to-be Yukon University, says Yukon College President Karen Barnes. Barnes adds that the primary goal for the institution and new facility will be to "excite the young people in the North, to think about science and really look at the problems that exist in the North and study how to solve them." YK Premier Sandy Silver congratulated the college and stated that the transition to Yukon University "further advances opportunities available in Yukon and the North." The Government of Manitoba has cut ACCESS funding for post-secondary institutions by $1M for the 2018-2019 fiscal year and cut $1.6M that was earmarked for bursaries. A spokesperson for the provincial government stated that cutting the bursaries was part of an effort to streamline the student financial aid system, adding that the bursary program was previously under-subscribed and unavailable to students at Assiniboine Community College, Brandon University, and Universitie de Saint-Boniface. "A lot of the mission was to encourage Indigenous students and, in particular, students who have faced barriers to be able to get into a post-secondary program where they've been under-represented in the past," said NDP Leader Wab Kinew. "Without resources to pay for tuition and other supports like tutoring, it's going to mean more barriers." Kitchenuhmaykoosib Inninuwug (KI) First Nation, also known as Big Trout Lake, has received a pledge of funding from Indigenous Services Canada of over $42M to build a new school that will support students up to Grade 12. The current school only goes up to Grade 10, and is reportedly in need of extensive repairs. "To us, this is good news because it gives the opportunity for our kids to stay here and finish Grade 12 and then either move on to college or university," said KI First Nation Chief Donny Morris. Morris stated that a location for the school has been decided on, and that once the new faculty has been built, the old one will be demolished. A new online platform called the Coders North Initiative is bringing together Indigenous digital producers and providing a platform to highlight educational opportunities for Indigenous youth. "This platform is a place where Indigenous people can do anything with technology as it relates to their culture," said Lisa Farano of Elephant Thoughts. "If kids can learn to code, those are skills they can use anywhere. " The platform features artists, web designers, coders, app designers, and gamers as featured experts, and includes learning modules where students from Grade 8 to 12 can learn about computational thinking, coding, and Indigenous entrepreneurship. Students can track their progress by earning beads each time they complete a codint activity. Access to the portal and resources is free, according to Timmins Today. Kindergarten students at Antler River Elementary School on Chippewas of the Thames First Nation are learning to speak Ojibwe through a new language immersion program at the school. The program is based partially on the Anishinaabemowin Revival Program at Lakeview School on M'Chigeeng First Nation, and teacher Betsy Kechego hopes to be able to expand the program to first-graders next year, adding additional immersion grades every year. "I see it as something big, and it's going to thrive because we have so many people that believe in the language piece as a main core of our identity," said education director Crystal Kechego. Students at the Matawa Education and Care Cnetre in Thunder Bay were recently able to try cross-country skiing at the Kamview Nordic Centre, thanks to a new partnership. Spirit North, the partner organization, is a charitable group that helps First Nations start cross-country ski programs for youth. The organization provided 30 full sets of ski gear to the centre and arranged for the students to be joined by experienced instructors. "It's really neat because we have students from the nine Matawa different communities at our school" explained Outdoor Education Teacher Joey Miller, "and the hope is that some of them will be able to bring skiing back to their communities in the future." Student Mya Dixon of the Eabametoong First Nation added that she appreciates getting the opportunity to get out of the classroom and experience something different. Circles for Reconciliation is a grassroots, non-profit, full and equal partnership between Indigenous and non-Indigenous people. Our goal is to 1) inform people on the history of Indigenous peoples in Canada, 2) to encourage the participants to share their stories and thoughts on the theme of the day and, 3) to create and maintain respectful relationships. Very early in the final TRC report, the Commissioners tell us that for them, reconciliation is based on respectful relationships. We offer circles that are composed of 10 participants (five Indigenous and five non-Indigenous), led by two trained facilitators (one Indigenous and one non-Indigenous). Each circle meets once a week for ten weeks for 75 minutes per session. There is no cost for the participants. What we ask for is a common interest in achieving truth and reconciliation and equality of opportunity for Indigenous people in Canada, a willingness to listen and to share, and a commitment to attend the ten meetings. That is enough time to establish the beginning of meaningful relationships. The project has the endorsement of a large number of Indigenous and non-Indigenous leaders and organizations. The position to be filled is funded by The Toronto Foundation. We are hiring an "Event Coordinator" for Circles that are beginning in the Toronto area. The successful candidate will work closely with our Community Recruiter in the Toronto area and report to Raymond Currie, the Project Coordinator and to the Toronto Advisory Committee. The Coordinator will become a member of the Advisory Group of the project. It is a part-time position of approximately 15 hours a week. Occasional availability on evenings and weekends may be required. The job can be done from one's home or other convenient location. Easy accessibility of the Coordinator by the public will be essential. Funding for the position is supplied by a grant from the Toronto Foundation. One month's notice will be given prior to the end of the contract. The salary will be commensurate with experience. It will be paid bi-weekly on submission of the logbook of contacts, approved by the supervisor. The position will begin as soon as possible. There will be training for the position and a probation period of six months will be in effect after the hire. The successful candidate will be expected to have a good understanding of the process of reconciliation as described in "Honouring the Truth, Reconciling for the Future," the final report of the Truth and Reconciliation Commission. (The report is available online). Candidates should become familiar with our website of the project prior to an interview for the position (www.circlesforreconciliation.ca). High school graduation as well as some post-secondary education will be an asset for an applicant. The Events Coordinator must be articulate, pleasant, honest, and flexible in addressing issues that come up. The Coordinator must be able to interact effectively with groups in cases where it is necessary to secure sites for the discussion groups. Self-starters, and individuals able to work relatively independently are particularly important characteristics, as well as strong administrative skills. Candidates must have own telephone to keep in contact and organize weekly circles for participants. A computer needed to complete necessary word documents and reports etc. The candidate will require a strong knowledge of Microsoft office, including word, excel, outlook and power point. Actively create, update, and maintain registration databases for any (e)mailing, correspondence, and promotional reasons. Actively organize, maintain and coordinate weekly circles based on registrations; while maintaining utmost confidentiality of all information seen and/or heard at all times. Please supply your resume as well as at least two references with their approval and their contact information. They will be contacted by the Supervisor. What started as a complaint about cultural approriation has turned into a path to inclusion and connection with the Indigenous community. About two years ago, a concern was raised that one of the chairs painted as part of the Art on the Street program contained images that could be considered to have been derived from First Nations iconography. "It started with the cultural appropriation issue and there being some identification that there is a community within our community that's not being recognized," said Dean Collver, director of parks, recreation and culture. The municipality has adopted an art policy that works with organizations on art that may include an Indigenous component. "The policy asks that we consult with First Nations educators and elders in order to foster more collaboration between non-Indigenous and Indigenous artists," said Tanya Mazza, manager of arts and culture. The town has continued to take steps to bridge the gap with the Indigenous community. In September, the town opened the Awen Gathering Circle at Harbourview Park. The facility was created with the assistance of Indigenous architechts and under the guidance of elders such as Dr. Duke Redbird and James Carpenter. Carpenter is a messenger known as an Oshkaabewis and travels across Canada to different communities. For the past three years, he has been involved in the town's Canada Day ceremony, made a presentation at the council inauguration in 2018 and at the Mayor's Levee. 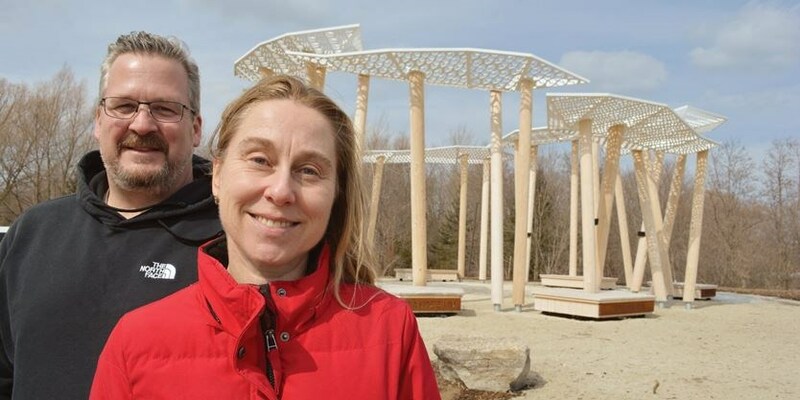 "In my 20 years, the Town of Collingwood is one of the first that have started to bridge the gap," he said. "For a very long time, Aboriginal People around the area around Collingwood, we've kind of felt left out". He believes any kind of awareness is positive and he's not one "to point fingers and blast communities for things they haven't done." Copyright 2014-2018. Rotary HIP. All rights reserved.